This month, I have been assigned Lick The Spoon for The Secret Recipe Club challenge. The name of the blog conjures up images of cake baking and offering the spoon to Dave – something he loves to do. It also reminds me of my niece Sasha, who licks away at her fingers the whole time during the baking process. Louise is an experimental Australian cook who is also a mum and a housewife and she shares with us that she bakes when she has time! I considered trying a baking recipe, but we are still on diet! I spent quite a long time browsing and trying to decide what to make. Not an easy thing to do before breakfast, when you are hungry and all the dishes look good! 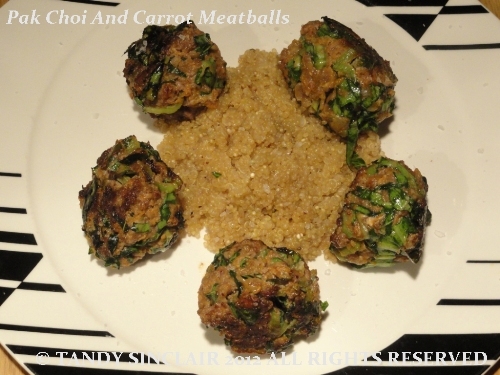 I finally decided I would make the Spinach and Carrot Meatballs as we are eating a lot more vegetables now that we are on a low carbohydrate diet. I had just purchased a packet of pak choi (bok choy) which is a Chinese cabbage. It has a soft green leaf, similar to that of spinach, and I thought it would make a great substitute. I included the entire stem and this may have resulted in my balls not forming without the aid of an egg yolk. The meal was delicious (thanks Louise) and we had enough meatballs for a generous portion for supper, as well as lunch for me the following day. and if you are wondering what all the marks are on the plate, it is flaked oryx salt I used as a finishing salt. And click here to see what was made from my blog this month! Ooooh I love the look of these and will definitely try to make them. Yum, Tandy! Thank you. Hey, Tandy! Finally making it over to your SRC post. I planted some Pac Choi in the garden last weekend. I love to eat it raw in salads, but I can’t wait to try this recipe when they are ready to harvest. Glad to have been assigned your blog this month! This looks amazing Tandy: it’s quite adventurous for me, but what a combination of ingredients. Lovely. I think we all agree here that adding the veggies was a big bonus! Looks so good! I think the idea of adding vegetables to the meatballs is excellent. Adds crunch and flavor. I like the idea of adding greens and carrots to meatballs. I don’t eat meatballs often, doing it this way seems much more appealing! I would have never thought about adding bok choi to a meatball 🙂 Love this! What a great recipe, Tandy! I’m picking up Bok Choy for a different recipe and hadn’t heard of this type of “choy” before. I’m also getting braver about chucking green stuff into recipes.. it makes them so much healther, I love the addition in this dish! I also have snails in my garden – I know that growing celery next to lettuce dissuades them so I wonder if the same would hold for bok choy? Great idea of adding bok choy in the meatballs…not only looks pretty (green) adds vegetables to the meatballs. I will definitely add bok choy next time making meatballs. I may not eat meat, but the idea of carrot + greens balls sounds amazing. Bet I could use some mashed beans instead of the beef and these would be delish. Love the idea of adding the bok choy. Now they sound very good indeed. We can sometimes get pak choi here (surprising!) so could tackle these! Nice idea to add veg, makes the mince go further.